Tonight was movie night at the theater. Linda and I have not had many opportunities, between my trip and a cruise that she took, to indulge in this favorite pastime. 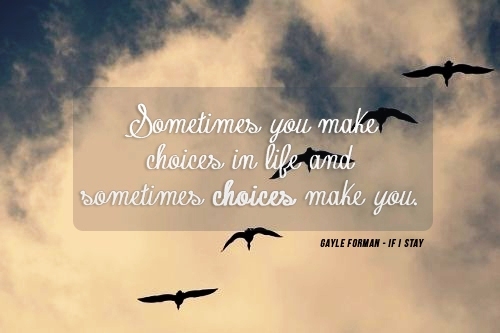 We had a couple of films we were interested in, and for my first today, we settled on the recent release, If I Stay. 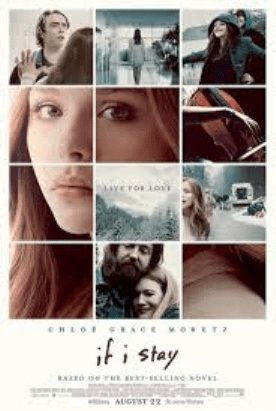 If I Stay stars Chloe Grace Moretz, Mireille Enos, Jamie Blackley, Joshua Leonard, and Stacy Keach. It was directed by RJ Cutler and is based on the novel by the same name, penned by Gayle Forman. This drama is rated PG-13 and has a run time of 1 hour and 47 minutes. Mia (Chloe Grace Moretz), a 17 year old girl, finds herself at a crossroad. Her biggest decision seems to be whether to pursue a musical education at Julliard or remain in her hometown of Portland with her boyfriend, Adam (Jamie Blackley), while he launches his career as a rock musician. And then, in an instant, riding in the car with her family on an icy road, life shifts. There is a horrific head on crash. Mia wakes up to find she is having an out of body experience. She observes the paramedics working intently over her still body, near the demolished car. Confused, not knowing where the rest of her family members are, she follows her battered body into the ambulance and to the hospital. Alternating between flashbacks that tell Mia’s back story and present day scenes in the hospital, the movie tells of the relationships between Mia and her amazing family, Mia and her musical genius with the cello, and Mia and Adam. Raised by loving and supportive parents, played by Mireille Enos and Joshua Leonard, Mia has been exposed to music since her birth. Although her parents tend toward punk rock, her father being part of a band until the birth of Mia’s brother, Mia fell in love with the cello when she was eight. The love of her life is the cello, until she meets Adam. Adam appears to have his life completely figured out. Already part of a very successful band, before he’s even graduated from high school, Adam is drawn to Mia and the passion she has for classical music. Music brings the two together, and threatens to tear them apart as each desires to pursue their dreams, Adam with his rock band and Mia by attending Julliard, in New York City. Mia’s parents support her decision, no matter where that choice takes her. But Adam and Mia find the strain of wanting to travel down different paths threatening their future together. In the hospital, staying near her comatose body, Mia finds she must make a far more difficult choice….leave to be with her family, who have all died as a result of the accident, or stay….and live a much different life than the one she had envisioned. Friends and other family members keep a vigil from the waiting room. Her grandfather (Stacy Keach) bids her a tearful goodbye and tells her to go, if it is too difficult to stay. He also tells Mia that her father left the band because of her, not because of the birth of her baby brother. He sacrificed his musical career because he recognized the gift that Mia had and sold his drum set to pay for her cello. Adam stays near Mia’s bedside as well, singing a song to her that he wrote, and at last, reading to her the letter from Julliard that she had been anticipating. From a place of deep grief and love, he begs her to stay, and tells her that he will let her go, to pursue her dream, if she will only live. Linda and I realized quickly that we were the oldest females in the movie theater! We were surrounded by younger ladies. We enjoyed the movie, as did the rest of the audience, as indicated by their responses. The character of Mia, although only 17, was an old soul, and I could identify with her. The film was beautiful to watch as it explored Mia’s relationships. There was much to admire about her parents and their unconventional parenting style. And I enjoyed watching the developing romance between Adam and Mia. They had different backgrounds, different musical abilities and styles and yet their passion for music brought them together and bound them. It is common, among those who have fallen in love, to question the journey ahead when two people seem to moving along paths that will take them far from each other. Does one sacrifice for the other? Do both sacrifice love for the sake of promising individual futures? One of the most beautiful scenes in If I Stay centered around an inspiring duet between Mia and Adam, and impossibly, between the cello and a guitar. That magical scene blended the two young lovers and two seemingly incompatible musical instruments and created something new, something beyond. 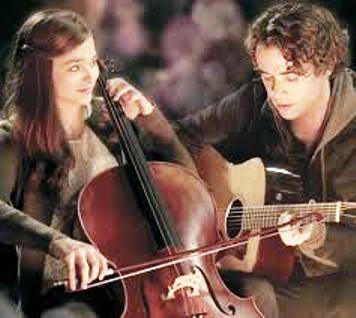 The most amazing relationship to watch during the film was the one Mia had with her cello, and ultimately, herself. I love the haunting sound of the cello. It speaks to me, very much like the bagpipes do. The soundtrack for this movie was amazing, because of the cello pieces. Mia loves Adam. And she loves the cello. Much of her indecision on whether to stay and engage life, or leave, rests with what she believes about herself and her future as a musician. During a flashback, Mia’s father tells her, “Sometimes you make choices in life and sometimes, the choices make you.” The truth of that phrase resonated with me, and in the end, the choice makes Mia. This was a very powerful movie, beautifully done. My emotions tumbled from smiles and laughter, to tears and a tightening of the chest. Love is a journey teeming with joy and sorrow, lessons and spontaneity, and yes, choices. Sometimes the best choice is to keep journeying, and see what unfolds.